– 1 server acting as a client and running the gearman-job-server daemon and running the client script to send the task name to the queue of the job server. 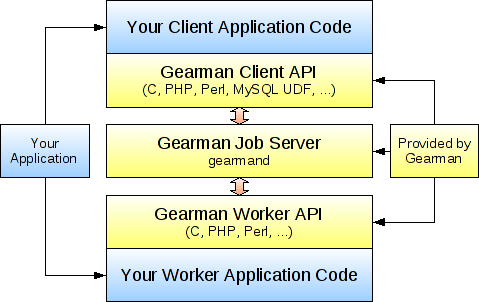 – 2 servers acting as workers (this servers will run the jobs) that basically it connects to the gearman job server and get the tasks name from the queue, and run the script associated with the task name. It takes as parameter the task name identifier that the workers will take and run the script associated with it. For the workers part I run the script cron_worker.pl on the workers servers (it runs in an infinite bucle so we can setup it as a daemon process in background) and at the time that one task is put from the client it will takes this task name and look for the path to the script associated with the task name, defined on a json file and it will runs the script. Copyright © 2019 [email protected]#. Powered by WordPress. Theme: Spacious by ThemeGrill.